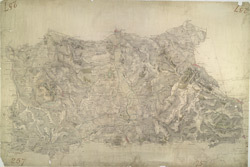 This drawing of the area north-east of Birmingham was executed by Robert Dawson, who used different shades of green to distinguish land uses. Sutton Coldfield is depicted at lower right. Now a residential suburb of Birmingham, it was originally a market town with Sutton Park. The 970-hectare site was a private estate and one of Henry VIII's favourite hunting grounds. Areas of woodland, heathland and wetland make up the landscape of the park.